Even though many on Wall Street believe that a default remains unlikely, the financial markets are starting to become agitated. 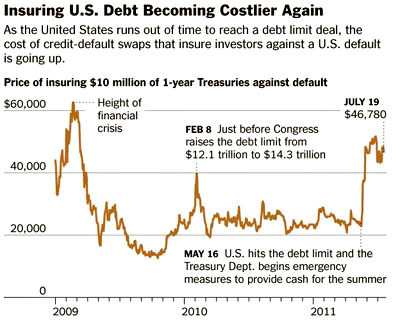 Volatility in stocks has soared, and some investors say stock prices are falling because a United States default could severely raise companies’ costs of doing business. In the Treasury market, investors are starting to sell, fearing that the government will not make good on some interest payments that will be due next month. And complex financial instruments that will pay out if the United States defaults have become twice as expensive to buy as they were at the start of the year. Wall Street helped elect ’em, and only now are they finally figuring out what they got themselves into. Who knows? If the GOP wackos really do run the train off the cliff, maybe rich people will finally figure out that paying a few more percentage points in income taxes isn’t such a high price to pay for sanity after all.